They don't call it the Show Me State for nothing  especially around Christmas time! What with holiday spectaculars going on in Branson, St. Louis, St. Charles, Springfield and Kansas City (and all points in between) it's sometimes difficult to know where to begin taking in all the excitement during November and December in Missouri. Originally known as The Missouri Rockets. 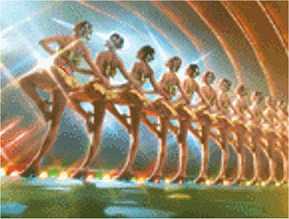 • In 1925, a St. Louis, MO dance troupe were known as "The Missouri Rockets". On tour in New York City a year later, the Roxy Theater featured them as "The Roxyettes". They soon caught the eye of Radio City Music Hall managers, who decided to rename the leggy dancing sensation for their grand opening in 1932. And The Rockettes have gotten star billing ever since. • The Plaza Lights in Kansas City began with a single strand of Christmas lights strung over a store entrance in 1925. Today, one of the most spectacular holiday light shows in the Midwest covers a 15 block area, with lighting crews beginning work around Labor Day to complete the annual display. • During a busy holiday season in 1917, a Kansas City MO stationery store ran out of wrapping paper which, at tht time, was simple white tissue paper. So brothers J.C. and Rollie Hall quickly substituted a stack of colorful "fancy French paper" they found in the back room to go on sale for 10 cents a sheet. It became an instant bestseller. The following year, a line of decorative holiday wrap was being designed and sold locally by the Hall brothers. The company they founded? That was Hallmark. Winter Wonderland at Tilles Park - A major St. Louis attraction features a drive through illuminated pathways with dancing snowflakes, jumping fish, a magical gingerbread house, and more awesome twinkling exhibits. Breakfast with Santa and Wild Lights at St. Louis Zoo - Find kid-friendly fun located at the Lakeside Cafe with a Christmas feast of French toast, donuts and juice, costumed characters, and photo-ops with Santa and Mrs. Claus. At sundown, come back for the light show! Ozark Mountain Christmas in Branson, Missouri - What's happening at dozens of venues in Missouri's premiere entertainment center with dates, times, travel packages and ticket info along with information on special holiday parades and light shows. Way of Lights - Check out a dazzling array of lights leading the way to Bethlehem, along with camel rides at the petting zoo, puppet shows, and Christmas tree displays at the National Shrine of Our Lady of the Snows in Belleville. Christmas in the Valley - There's mountain charm and holiday fun in Ironton, with a weekend of parades, carriage rides, a Christmas tree lighting, and special entertainment. Springfield Holiday Events - Upcoming holiday hoopla includes the downtown Christmas parade, Monett Festival of Lights and New Year's Eve First Night celebrations. Christmas at Crown Center - Check the calendar for this year's spectacular, featuring a 100-foot Christmas tree, a dancing fountain, and top entertainment. While you're here, warm up with a peak inside Santa's Gingerbread Village. Christmas Tree Farms in Missouri - Where to find precut and choose-and-cut Christmas tree farms by region including listings for the Kansas City and St. Louis area, with contact info and related links to more holiday fun, including sleigh rides and free hot chocolate and cider.